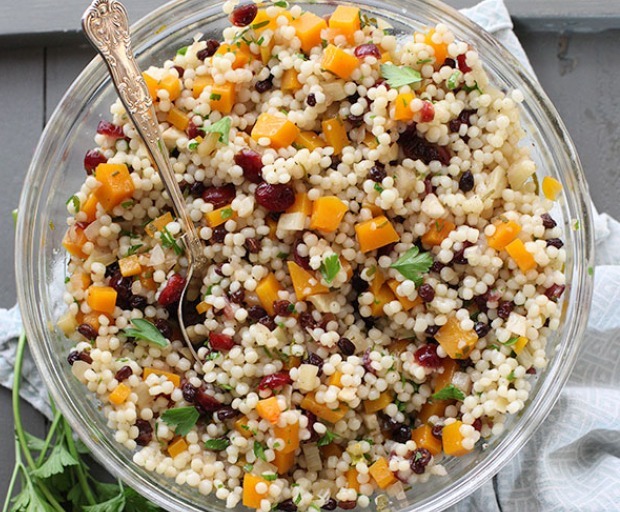 A delicious winter salad is just what the doctor ordered, and anything with couscous certainly doesn’t disappoint. Our favourite salad recipe is packed with flavour including fresh vegetables, and sweet cranberries for that wholesome taste. This recipe serves 6-8 with a little leftover for lunch tomorrow! Boil a pot of water, then add the couscous and cook until al dente. Drain in a colander, and set aside to cool. Heat the olive oil in a large pan over medium-high heat. Cook the shallot for 1 minute, then add the diced fennel and cook until it softens. Add the butternut squash, sage, cranberries, currants, and apple juice, and cook for 15 minutes. Season as you like with salt and pepper. Transfer the mixture into the bowl with the couscous, but keep 1/4 cup of the apple juice for the vinaigrette. In another bowl, combine the apple juice, canola oil, red wine vinegar, salt and pepper. Add the couscous and parsley, then let it sit at room temperature for 30 minutes. It will make everything taste so much sweeter.